Medicinal Properties:Leaves and fruits of the plant have medicinal properties used in various Ayurvedic preparations. Fresh leaves and seeds have been an integral parts of Indian cooking. Fresh leaves and powdered coriander are used for garnishing various food articles all over India. 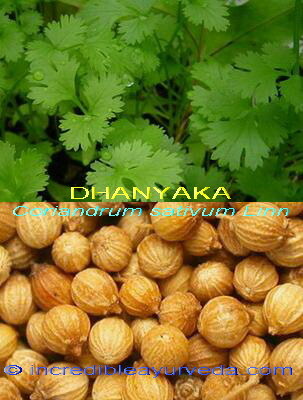 Dhaniya has a significant effect on the digestive process it prevents flatulence and controls spasmodic pain due to indigestion or gastritis as it has antispasmodic properties. Crushed fresh leaves if chewed help to heal mouth ulcers, sore throat, anorexia and nausea. Seeds are helpful in loss of memory, nausea, vomiting, diarrhea, indigestion, dysentery, cough, cold and urinary disorders.